In his book “The White Pass” by Graves, the first 1/3 of the book deals with the intrigue and planning that went into creating the railroad from Skagway to Whitehorse. British investors had for many years researched the task and had sent various engineers and financiers to Skagway to review the situation. In the famous meeting of Michael J. Heney with the British investors, they came to believe that with the right men the task was possible. In 1897 there were actually 32 proposals to the Canadian Government to build the railroad. By the start of construction there were three companies that were organized to build the rail line. But on this day, July 30, 1898, the charter rights and concessions of the three companies were acquired by the White Pass & Yukon Railway Company Limited, a new company organized in London. So, when I worked at White Pass (in marketing) I discovered that the true name is actually White Pass & Yukon Route Railway (note the use of the ampersand, not the word “and” ). But the legal name is still the Pacific Arctic Railway and Navigation Company, often referred to as PARN. Now I am sure I will be corrected here, as it is confusing. Happy Birthday to White Pass! The 110-mile White Pass and Yukon Route railroad (WP&YR) was completed with the driving of the golden spike on July 29, 1900, in Carcross, Yukon Territory. The railroad connected the deep water port of Skagway, Alaska, to Whitehorse, Yukon Territory, and beyond to northwest Canada and interior Alaska. Built in 1898 during the Klondike gold rush, construction of the WP&YR was considered an impossible task, but it was literally blasted through coastal mountains in only 26 months, from May 28, 1989, to July 29, 1900. The railroad was built to replace narrow, dangerous White Pass Trail, also known as Dead Horse Trail, which was taken by prospectors heading from Skagway to the Yukon and Atlin goldfields. Each prospector was required to carry one year’s provisions, or about 2,000 pounds of food and supplies, on the trek north. Because a prospector usually could not carry more than 80 pounds at up the trail at one time, each individual had to climb the mountain 25 or more times. To ease the load, nearly 4,000 horses were brought in. 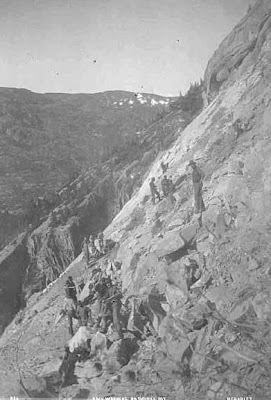 The prospectors worked or starved all but a few horses to death, giving the route the nickname “Dead Horse Trail.” The completion of the White Pass & Yukon Railroad provided an easier route for crossing the mountains, and prospectors and others thereby escaped the backbreaking work of transporting required supplies to the goldfields. The $10 million project was the product of British financing, American engineering, and Canadian contracting. 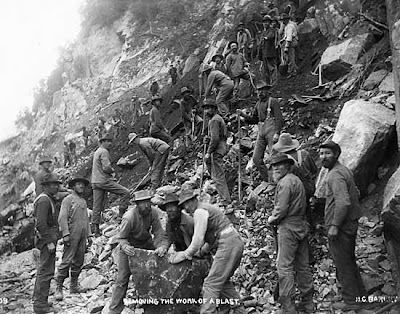 Tens of thousands of men and some 450 tons of explosives overcame harsh and challenging climate and geography to create “the railway built of gold.” The railroad climbed almost 3,000 feet in just 20 miles and featured steep grades of up to 3.9%, cliff-hanging turns of 16 degrees, two tunnels, and numerous bridges and trestles. The steel cantilever bridge was the tallest of its kind in the world when it was constructed in 1901. To keep British backers of the project appraised of the railroad’s progress, both during and after construction, Barley was hired as a full-time photographer. In the early 1900s, the WP&YR held a near monopoly on traffic to the goldfields, slowing much of the travel on alternate routes into the Yukon. One such route was the 300-mile Dalton Trail, which connected Pyramid Harbor near Haines on the Pacific Coast, to Fort Selkirk on the Yukon River. The WP&YR route began in Skagway, with stops along the route at what were originally major construction camps, including Log Cabin, Bennett, Carcross, and Robinson, before ending at Whitehorse. Today the WP&YR is Alaska’s most popular shore excursion, operating on the first 66 miles of the original 110-mile line (Skagway, Alaska, to Carcross Y.T.) and carrying over 300,000 passengers during the May to September tourism season. 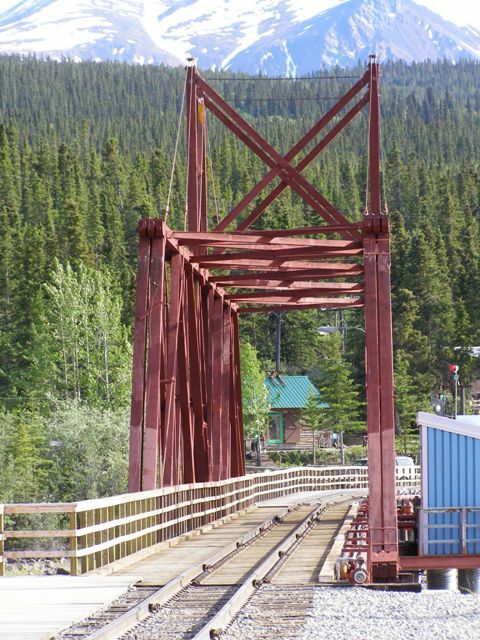 The narrow gauge White Pass & Yukon Route Railroad is an International Historic Civil Engineering Landmark, a designation shared with the Panama Canal, the Eiffel Tower, and the Statue of Liberty. 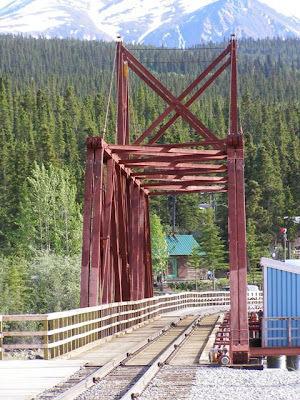 Seen above is the bridge over the Nares River from Lake Bennett to Lake Nares at Carcross. The spike ceremony happened just in front of this bridge, where the photographer is standing. Colville Terrett was born on June 1, 1852 in Washington D.C. His family had a long history of military service going back to the American Revolution. He graduated from law school in 1874 and in 1878 joined the U.S. Signal Corps. He fought in the Apache Campaign and in the Spanish American War where he was recommended for a brevet. He then went to the Philippines. 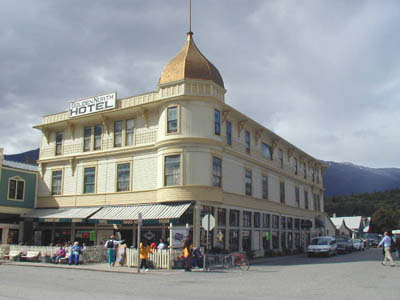 Major Terrett of the 8th Infantry arrived in Skagway in 1903. He stayed until 1904. 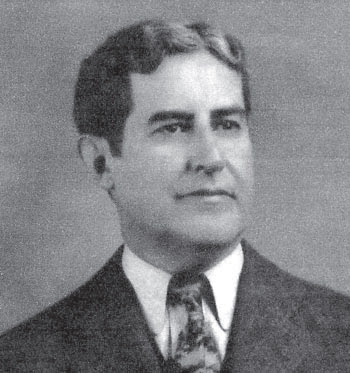 Going back to Texas, he retired in 1912 and was a charter member of the Santiago Society and the Sons of the American Revolution. He died in Augusta Georgia in 1913. In her book of stories from the Gold Rush, Ella Lung Martinsen in “Trail to North Star Gold” remembered an organ grinder in Skagway in 1898. She said the monkey was putting on a “Soapy Smith street show”. It was dressed in a tiny man’s suit, a red striped vest, a derby hat and high topped boots. Across his chest dangled an imitation nugget watch chain, and in his belt was stuck a toy pistol. 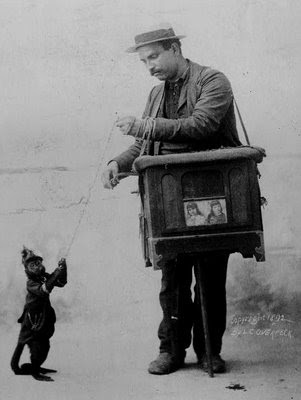 I haven’t seen an organ grinder with a monkey since about 1969 and that was at Knott’s Berry Farm in Anaheim. As kids, I remember my brothers and I would beg pennies from our dad to give to the monkey who would grab them and put them in his little bag. Seen above is a picture from 1892 but not from Skagway. Trail to North Star Gold by Martinsen p 24-25. Seeing another business opportunity in Skagway, he bought up stray cats in Portland for 50 cents each, brought them to Skagway and sold them to dance hall girls for as much as $300 each. This earned him the apt nickname of the “Cat Man of the Yukon”. If he thought of himself as a cat wrangler, perhaps that is why he moved not long after, to Wrangell. There he bought the Ft. Wrangell Hotel, sent for his fiance, and started a drug store which he ran for several years. The family also ran businesses in Petersburg. James died in January 1974 in Seattle at the age of 103. Is this the source of the term “Wheeler Dealer”? Near Tunnel Mountain and Slippery Rock there is a famous cut in the rock called “Fisk’s Cut”. All that we know of the tunnel foreman was his name, Mr. Fisk. He was able to blast a nice tunnel which is still used many times a day! Seen above is a scene of the area that they worked on near Slippery Rock. Looks slippery! The only name he gave for one was “Bob the Maori”. So, looking at the records of the NWMP at the time of their crossing, there was a Robert Doe, a R. Kibblewhite, a R. Hisk and a R. Gane all from New Zealand. Kibblewhite and his traveling companion, C.V. Ledebur were both from Drury New Zealand which was a Maori community. So, by process of deduction, it might be them. 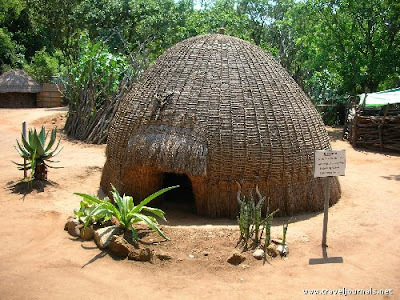 Seen above is an African traditional twig beehive house which probably resembled the cabin that the Maoris built in Dawson. John O’Neil worked for White Pass and was struck by a falling rock up at White Pass and died. His death record said his complexion was sandy, his height was 5’6″, and his weight was 140 lb. He was born in 1867 and died on this day, July 20, 1898 and was buried in the Gold Rush Cemetery on the 23rd of July. This Barley photo shows workers removing rubble after a blast. White Pass still uses explosives to remove hazardous rock, their storage shed for explosives is suitably up in the mountains near the track but far from mischievous fingers. Growing up in Southern California, my family and I would visit Yosemite every summer. There was a famous ranger there named Scharschmidt, but I don’t know if he was related to the Percy Scharschmidt that was here in the Gold Rush. Percy was born on this day, July 19, 1867 in Lewisham, England. He graduated from the University of Toronto in 1887 and served with the 10th Battalion in the Riel Rebellion before settling in Cumberland in 1892 with a pharmacy. His biography at Cumberland Heritage site says that he worked as a Superintendent of the “Yukon” railroad, but I have no record of that. He was the editor of the Bennett Sun from May 24, 1899 through 1901. 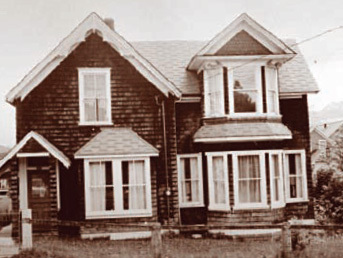 He retired to the Comox Valley (on Vancouver Island) and was involved in politics there, passing away in 1932. Seen above is his house which is on the Cumberland walking tour of historic houses. library.state.ak; wikipedia; Minter; Cumberland Heritage site.